Last fall, I had a speaking gig at the Pool and Spa show in New Orleans. After the presentation, I got to talking with James Scott, a Genesis 3 Pool Builder and the owner of Group Works Water Concepts in Connecticut. 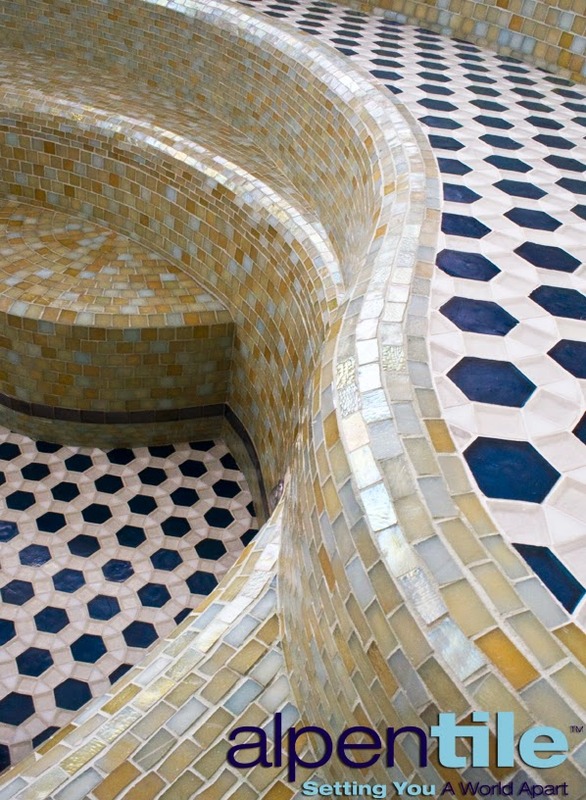 Instead of creating impact with vast expanses of glass mosaics, he was advancing his design approach, creating thoughtful impact through form, texture, and color. 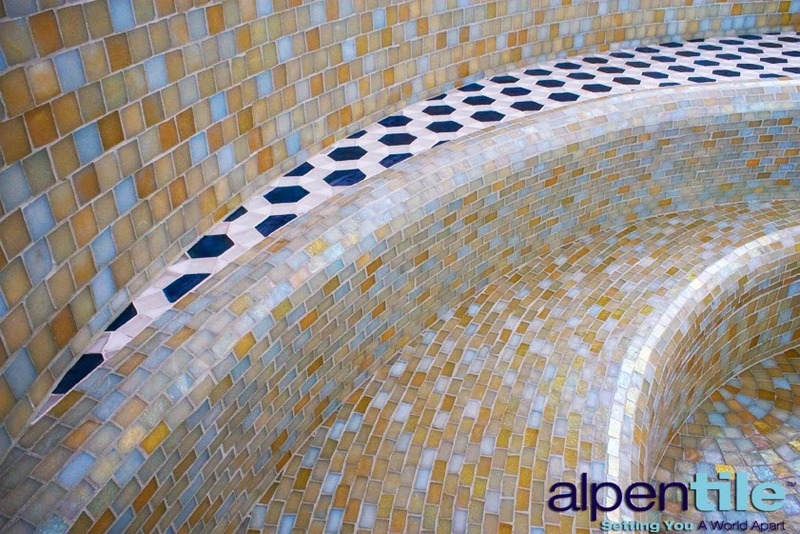 Today, there are so many tile products right at our fingertips, the design potential is endless. 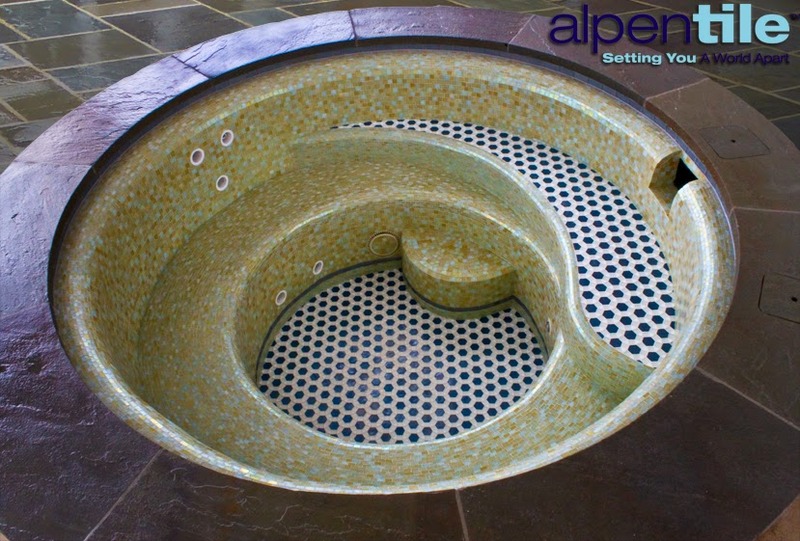 Equally as important, the best designers understand that a pool environment is very harsh, and if they don’t select an installer who knows how to navigate the installation process correctly, their design will be unfortunately short-lived. 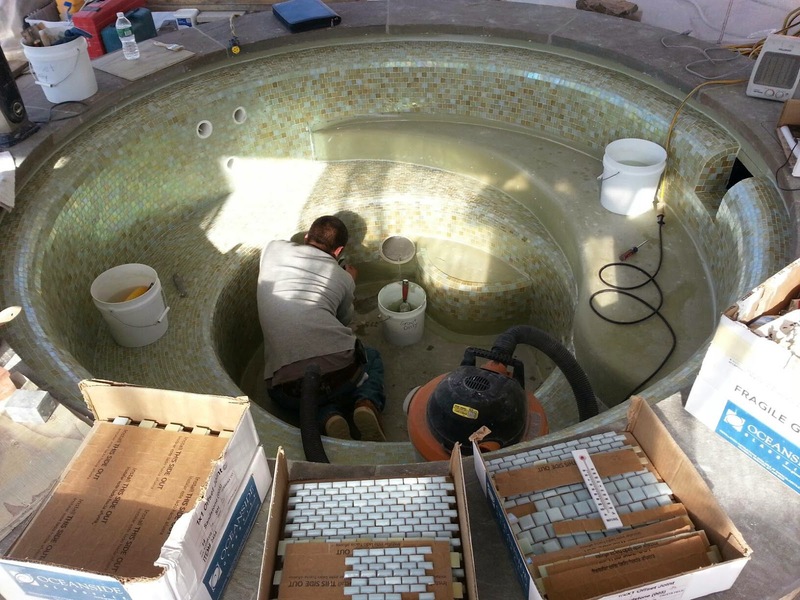 There is a right way and a wrong way, to install glass tile in a pool/spa. Jamie’s design inspiration came from the fashion runway, and he wanted to use bold pattern and unexpected color combinations. The beautifully intricate concept, including mosaics as small as 1/2″ x 1″ and a uniqueOceanside Glasstile field pattern with hexagons and tiny triangles, was an exact match to our expertise. The form included elegant curves, like this tear-drop step, which transitions from one pattern to another. If this area isn’t cut in with precision, the result is a visual mess. More importantly, if a novice attempts this method incorrectly, it can compromise the entire installation’s integrity, causing significant issues down the road. We articulate this when we discuss glass tile installations in pools & spas: Visual aesthetics and technical integrity must be closely tied if you want a beautiful installation that lasts for years. Here, you can see some of the templates we use for organic shapes like the step and floor. The remainder of the spa is a blend of field tile in 1×1 and 1/2 x 1 modules. These tiles are paper face mounted, and we are able to create a flat and smooth surface with the ‘alternate installation method’, our preferred method of installing glass mosaics. 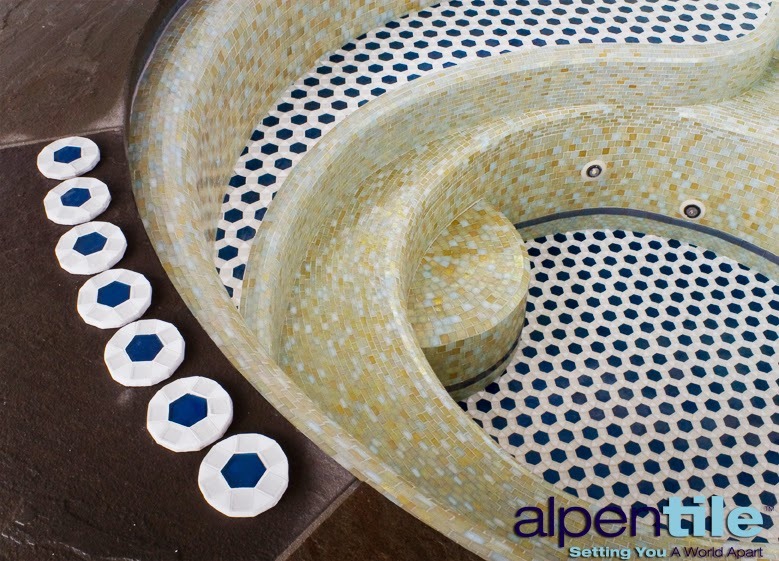 When glass mosaics are incorporated into environments like pools and spas, the technical difficulty of the installation is much higher than virtually any other environment where tile is used. 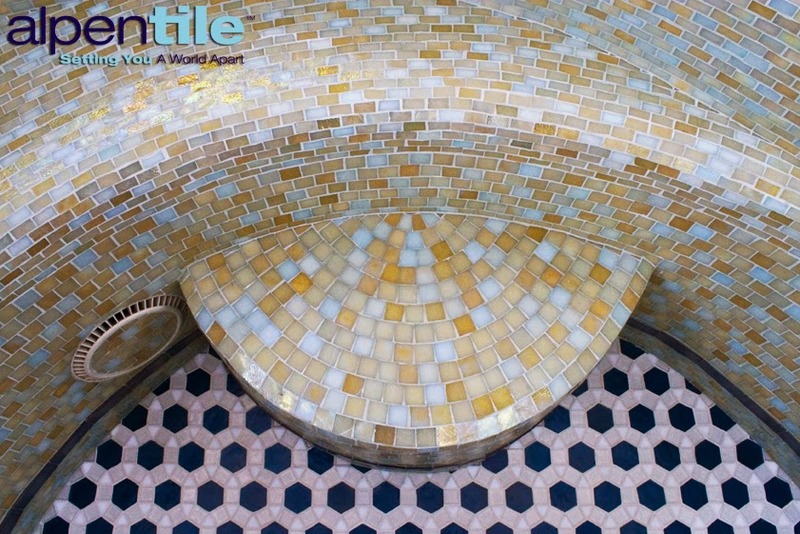 Add to that- complex layout, unique tile formats, artful texture combinations requiring precision installation… these installations require the highest level of technical expertise. When properly installed, these projects are the ultimate statement of luxury. We enjoy working with Jamie because he has a deep passion for design, and he understands the important relationship between design and craftsmanship. We recommend him for anyone with refined taste who wants an elegant and luxurious outdoor living space that will stand the test of time.